An Indian cargo ship with 13 sailors on board heading towards Africa was hijacked by armed pirates off the northern coast of Somalia, even as suspense persisted over the fate of Indian crew members of the Hong Kong vessel MV Stolt Valor. Somali pirates boarded the ship which was heading to Somalia and hijacked it south of Socotra island over the weekend, an official of the International Maritime Bureau said in Kuala Lumpur on Tuesday. The whereabouts of the ship and the fate of the crew members was not known as the maritime bureau received the distress report from a third party on Monday. “We are still verifying the time and date of attack,” the official said. 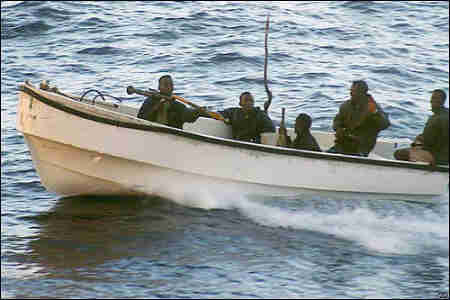 The hijack pushed the number of attacks by pirates this year in Somali coast to 74. A total of 30 ships have been hijacked and 10 remain in the hands of the pirates along with nearly 200 crew members. A concerned Indian Government has dispatched a powerful stealth warship to the area as momentum has been growing for coordinated international response to the spate of hijacking being unleashed by Somali pirates using speed boats. A powerful US naval flotilla is already in the vicinity of the hijack area monitoring the boarding of a Ukranian ship M V Faina which was carrying tanks and other heavy weaponry. The US warships have been joined by naval ships from NATO and Russia. Another Russian warship crossed the Suez Canal to join two other Russian vessels already there. The hijack has prompted the head of the maritime bureau’s chief Noel Choong to issue a warning for ships to maintain a strict vigil to thwart the pirates. “The momentum is still there, the attacks are still continuing in this key shipping route. So there is a need to be watchful,” Choong said. Some naval commanders have also suggested that shipping companies should consider hiring private security firms to guard the ships on the dangerous waters. Nick Cannon’s Bodyguard Means Business!